Indonesia is facing serious problems related to unsustainable land and forest governance, resulting in large scale deforestation and forest degradation. Budgets and budget policies are important elements of land and forest governance, critical to ensuring the implementation of development plans and addressing deforestation and degradation problems. Good budget policy requires performance targets supported by budget availability and strict controls to measure implementation, specifically related to (i) rehabilitation and preventing deforestation; (ii) controlling land exploitation; (iii) optimizing plantation productivity; (iv) preventing the clearing of more land for plantations. 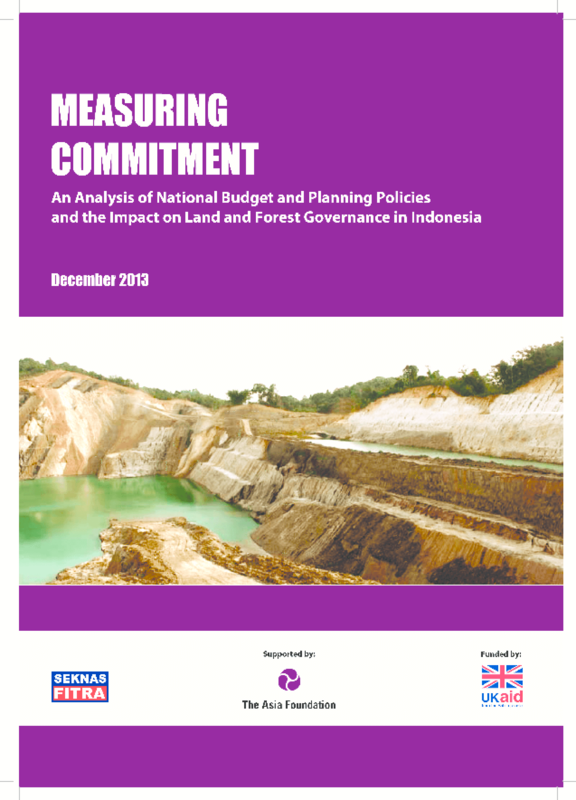 The Indonesian Forum for Budget Transparency (Seknas FITRA) conducted a study analyzing national budget and planning policies on land and forest governance in Indonesia. The study aimed to assess central government performance on budgeting, including commitment to budget policies and the resulting expenditure related to forest and land governance. Specifically, the study looked at two issues: the priority policies or plans by the central government related to land and forest governance as well as progress of achievements; and the orientation of national budget policy toward reducing deforestation and degradation. Copyright 2013 The Asia Foundation.